Dubai 90% Super Sale Ended After Three Days: Dubai enjoyed 90% of super sale organized by the Dubai Festivals and Retail Establishment, a Department of Tourism and Commerce Marketing agency. In this three day retail extravaganza, over 400 brands were participating with bargains at over 1,500 outlets across the city. A mad rush at some of Dubai’s top malls and participating outlets were recorded over the past 3 days, as bargain hunters took advantage of discounts of up to 90% off on a wide range of products and merchandise, including fashion, shoes, homeware, accessories and electronics. As per press release, customers were able to enjoy up to 90% discounts at Majid Futtaim’s outlets within Mall of the Emirates, City Centers Deira, Mirdif, Me’aisem, Al Shindagha and My City Centre Al Barsha. Some of the participating fashion and multi-brand department stores included Alexander McQueen, Christian Louboutin, Swarovski, Michael Kors, AllSaints, Giorgio Armani, Molton Brown, Tommy Hilfiger, Kenzo, Tory Burch, Stella McCartney, Roger Vivier, Ted Baker, Marks & Spencer, Harvey Nichols, Diane Von Furstenberg, Armani Exchange, Charlotte Olympia, Isabel Marant, Missoni, Boutique 1, Karen Millen, Etoile La Boutique, Debenhams, Forever 21, Sacoor Brothers, Damas, Shoemart, Max, Charles & Keith, NineWest, Athlete’s co, Skechers, H&M, Home Box, Western Furniture, Natuzzi and Centerpoint. 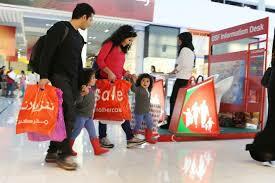 Parents shopped for the little ones and enjoyed deals offered at Mothercare, Ralph Lauren Kids, Mamas & Papas, while homeware stores such as Home Centre, Crate and Barrel and Zara Home were also offering unbeatable discounts as well as Sharaf DG. One Chinese tourist took advantage of the big discount and bought 18 pairs of sneakers. During the three-day mega sale, shoppers were treated to unbeatable discounts as more than 460 participating retailers across all categories including electronics, fashion, jewellery, home appliances, cosmetics, and more, will offer discounts of 25 – 90% off. Customers who shop from Dh500 to Dh1,500 received an Dh100 Mall Gift Card or prizes, while those who shop for Dh1,501 and above received an Dh300 Mall Gift Card or instant VOX Cinemas tickets.